This salad is very tasty and refreshing. The dressing is particularly nice. The bright colors were lovely on a gray winter day. Wash and peel the carrots. Slice them thinly or in matchstick sized pieces as desired and place in a bowl. Slice the spring onions, the white and very light green parts only. Peel the ginger and grate or chop. Wash and chop the coriander or cilantro, save few leaves to se as garnish. Wash and chop the chives. Mix the orange juice, rice vinegar, ginger, olive oil, salt and pepper to make a dressing. Add a splash of lemon juice to give a bit of a tang. Add the spring onion and coriander to the salad, and pour the dressing over. Mix well. Slice and peel the mango. 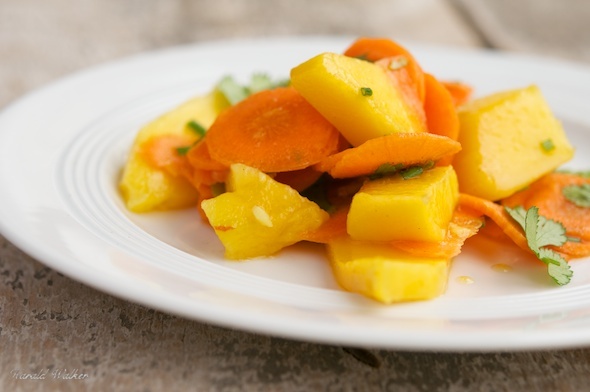 Cut the mango into bite sized pieces and add to the salad. 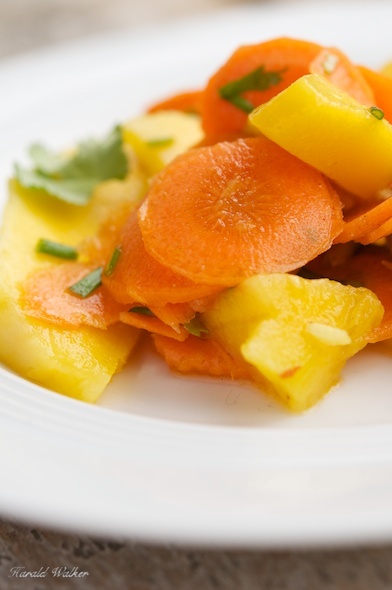 Reserve a few slices of the mango to use as garnish or a bed for the rest of the salad. Add the mango pieces to the carrots, sprinkle in most of the chives and gently mix. Serve the salad on individual plates, with a slice of mango and garnished with the rest of the chives a few coriander leaves. Posted by Chris Walker on February 20, 2013 in Carrot, Mango, Salads.